In August, I had my very first look at the beautiful Scottish Highlands and the Isle of Skye! Spectacular landscapes, castles, mysterious lochs, waterfalls, tasty seafood dinners, and Highland coos are a few of the many treasured memories associated with our Scottish Highlands itinerary. The Highlands make up the northwestern part of Scotland, and designate a primarily historical divide with the Lowlands area where there were once much larger cultural and language divides. Although a huge land area, the Highlands and the northern islands of Scotland are sparsely populated, primarily rural, rugged, and full of biodiversity. This area is perfect for those looking for natural beauty and an escape from city life. We did this first trip to the Highlands and Isle of Skye with Edinburgh-based small tour operator Rabbie’s Travel, and we’ll share our own trip experiences and lots of photos on that tour! We’ll also provide a general Scottish Highlands itinerary that we roughly followed for those who may be thinking of putting together their own independent Scotland trip itinerary. How to get to Scotland? There are multiple options for getting to Scotland. By plane, the main international airports are in Glasgow and Edinburgh, but if you want to arrive in the Highlands, Inverness Airport is also a popular option. If you don’t want to fly, then there’s train service from London to all of the major cities in Scotland. The fast train service from London to Edinburgh for example takes around 4.5 hours. You can also catch trains from cities throughout the UK or take the EuroTunnel to get here via France if you are coming elsewhere in Europe. As well as the standard train services, there’s also an overnight sleeper train that runs from London to Edinburgh, Glasgow, Aberdeen, Fort William, and Inverness. Known as the Caledonian Sleeper, this train service offers comfortable sleeper accommodation and a service that runs more slowly than the standard trains so you can sleep during the journey. A fantastic way to reach the Highlands. You can read more about our own personal experience riding the Caledonian Sleeper. You can save a lot of money on fares by booking train tickets well in advance. If you are in the UK and would rather travel by bus, there are daily coach connections to Scotland from a number of cities which take longer but may save you money compared to train fares. You can check National Express for coach connections and prices. What exactly are the Scottish Highlands? The Scottish Highlands refers to the northwestern area of Scotland and includes some of the northern islands. The exact boundaries of the Scottish Highlands differ based on different definitions. The areas of the Highlands and Lowlands of Scotland were once differentiated by differences in language and other cultural differences, and today while there is a still a strong Highlander identity, most of these differences have faded. Check out Wikipedia to read more about the historical cultural differences and boundaries of the Scottish Highlands. Ways to get around the Scottish Highlands? Once in Scotland, you can get around via car, bus, train, or via a tour company. Ferries are also used to get visitors to most of the islands. You can easily rent a car in any of the major cities of Scotland (Glasgow, Edinburgh, Inverness, Aberdeen, etc.) and do a self-driving holiday. This is a fantastic way to move at your own pace and see the things you want to see and have a lot of freedom. This is a great method for independent travelers who feel comfortable driving in the UK. You can also rent campervans or RVs in Scotland to do a camping holiday as there are many places to camp throughout the country. We would recommend renting a smaller RV as the larger ones won’t be able to easily access some of the smaller rural roads and parking areas. The important things to note if you are renting a vehicle is to make sure you are fully insured, check out our guide to driving in the UK, (especially if you are used to driving on the right side of the road), and be prepared for narrow, rural, and mountainous roads in the Highlands. On several roads in the Highlands and islands, you (or the other car) will have to stop and pull over to allow cars to pass as roads become one lane in some places. Make sure you understand how to drive on single track roads before you go. Winter conditions can make some roads impassable and dangerous, so be sure to check the weather forecast and road conditions if traveling in the winter. We recommend renting the smallest vehicle you need for the best maneuverability in the Highlands. The UK is well connected via a good bus system. Buses are generally referred to as coaches within the UK. 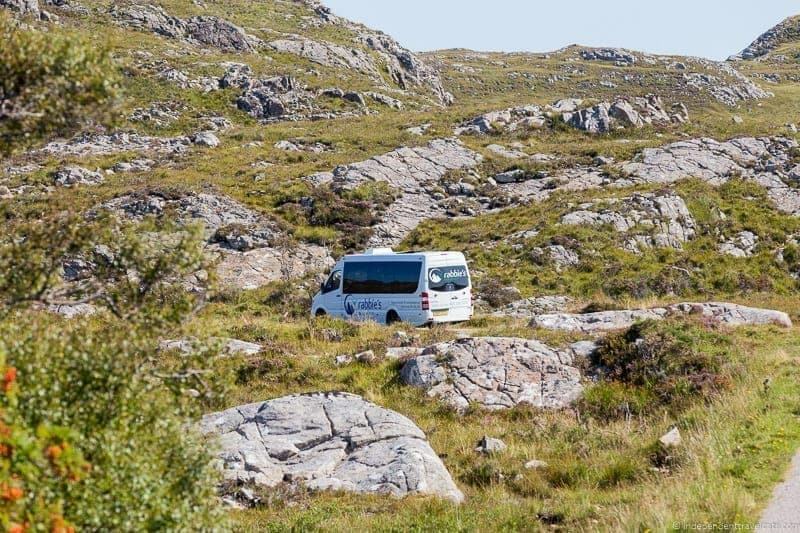 You can visit many of the cities and even villages of the Highlands via coach and can also use buses to get to many of the ferry connections if you are interested in visiting some of the Scottish islands not connected via road. Some websites to check out to plan your travel by bus are CityLink, National Express, and Stagecoach. You can book tickets online, by phone, or in person at bus stations (and sometimes on the bus). Best to book ahead, especially during busier times of the year (weekends, holidays, summer). If you are planning to do a lot of bus trips, ask about passes offered by the bus companies as most of the companies offer passes or tickets that allow for reduced fees for multi-journey trips. Also make sure that you check the baggage allowance restrictions as there are often limited space or special instructions for larger items (e.g., baby buggys, bicycles, sports equipment, extra luggage). The advantage of traveling by bus is that it is often the cheapest option and the coverage is good; however, bus services often do not stop at attractions in between cities and small villages may not have bus services. However, you may want to consider combining a bus trip with taxi rides, hikes, or bike rides from nearby towns to attractions that you wish to see not covered by the local bus network. Traveling by train is a great way to see some stunning scenery and the West Highland Line is well-regarded as one of the most scenic train journeys in Europe. Most of the trains in Scotland are run by ScotRail and you can check the available routes and services online. If you are going to be traveling in Scotland by train a lot, check out the special travel passes offered by ScotRail to see if they will save you money. There are also special trains that you can take in Scotland through parts of the Highlands including the Caledonian Sleeper (sleeper train), The Jacobite Steam Train (“Harry Potter train”), and the luxurious Royal Scotsman. However, while the train network is quite good in central Scotland, it is not as well developed in the Highlands and there are many towns and villages that do not have train stations. The train can still be a good option if you have only a short time or are OK with mixing train travel with other modes of exploration (rental car, taxis, bus travel, tour company). There are also a number of tour companies in Scotland that offer group and private tours of the Scottish Highlands. Many of the local companies offer departures from Edinburgh, Glasgow, or Inverness, but other departure cities are possible as well. 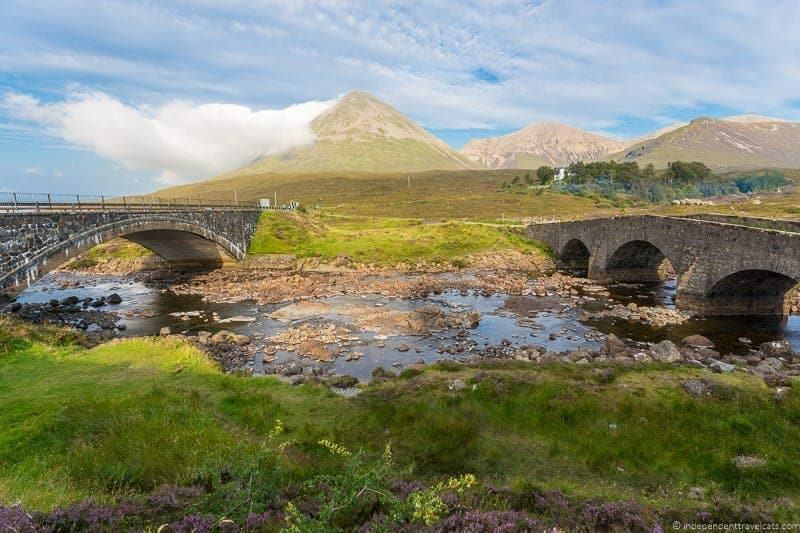 We have done several tours with local Edinburgh-based tour operator Rabbie’s Trail Burners, including a 5-day tour of the Scottish Highlands and the Isle of Skye which is the basis of this post. 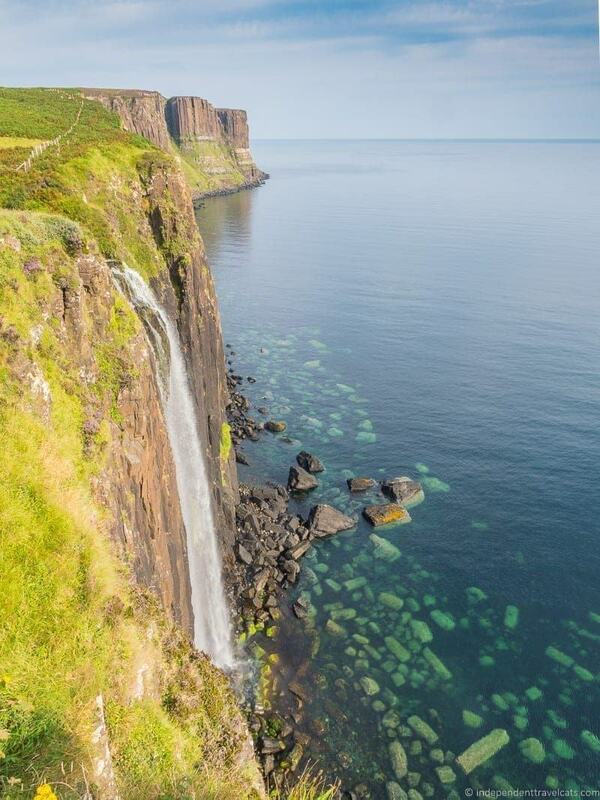 But if you have less time we can also recommend this 3-day Isle of Skye tour or a 1 day Highlands tour. Booking a group tour is easy, economical, and takes out the stress of planning and driving. However, the main downside to any group tour is that there is not that much flexibility in the schedule. 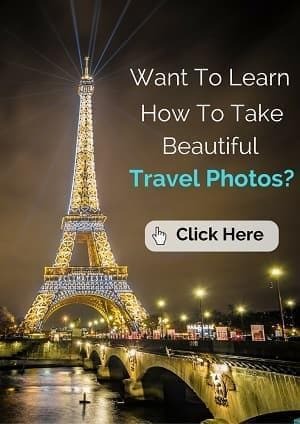 Another option is to book a private tour with a guide (offered by most tour companies) so you can help customize the itinerary and have more flexibility. Weather in the Scottish Highlands? One thing you can count on in Scotland is that the weather is fickle. Expect some clouds and rain on your trip, and potentially snow if you are visiting in the winter. January and February are the coldest months where temperatures may go below freezing (average 4 – 5 °C or 39 to 41 °F) and July and August are the warmest months (average 12 – 14 °C or 54 to 57 °F). The rainiest months are generally October to March and the driest months are generally the summer months. There is quite a bit of fluctuation though depending on where you will be in the Highlands or islands as the average temperatures and rainfall for Inverness are different from those of the Isle of Skye for example. The western Highlands because of the mountains and coastal winds are one of the wettest and windiest areas in Europe. Check the forecast before you leave for your trip to help guide your packing. Be prepared for rain and be sure to pack some rain gear (e.g., raincoat, boots, poncho, umbrella). Dress in multiple comfortable layers so you can adjust to fluctuating temperatures throughout the day. We did the trip discussed and photographed in this post in August and we were lucky with four out of five good weather days and only one rainy day. However, the week before, our driver told us that they had four out of five gray and rainy days, so you just never know and it is best to just be prepared! People planning a Scottish Highlands itinerary generally plan to spend some time walking, hiking, or climbing on at least part of their holiday. Scotland has several typical pests that you may encounter depending on the time of year of your travels, including ants, ticks, mosquitoes, and wasps. One of the most annoying creatures in Scotland has to be the highland midge, which is a small flying insect that only lives in northwest Scotland and northern Wales from the late Spring to later Summer. Midges tend to fly around in clouds and will bite humans, although they are not dangerous, just annoying. They move slowly, so if you walk quickly you can often move faster than they do, but if you are stopped you can easily get swarmed by hundreds of these pesky creatures. Similar to mosquitoes, they are most prevalent in damp and humid places and at dawn and dusk. If you are planning to be traveling in the Highlands in Spring or Summer, you might want to come prepared with a midge repellent such as Smidge. Avon Skin-So-Soft is also said to work as a midge repellent although we have not tried it. Other pesky creatures to watch out for are ticks as I got several from wandering around the high grasses around the lochs in the summer, so be sure to check your scalp and body for them after walking in grassy areas. The best protection for ticks is using an insect repellent that contacts DEET (N, N-diethyl-m-toluamide) or permethrin and wearing clothing without skin-exposing gaps. If you are not familiar with ticks, be sure to read about the proper way to remove a tick in case one becomes attached. Best time of year to visit the Scottish Highlands? The Scottish Highlands are a great place to visit no matter the time of year. If you are looking for the best weather, May to September are your best bets. To avoid crowds, avoid the busiest months of July and August. During the summer months you’ll find many towns hosting Scottish Highland Games. The winter brings snowy mountains, holidays celebrations, and many fewer visitors. You’ll find cheaper rates during the winter months but you’ll also find that some guest houses, hotels, and restaurants shut down on the off-season months (October to Easter) and some attractions may have reduced hours or shut down completely. This is particularly the case in the smaller villages where you may have difficulty finding even basic services. So if there are specific places you want to visit, be sure to check ahead to see if they will be open and their hours before you book your trip. As already mentioned, we took a 5-day bus tour of the Scottish Highlands with Rabbie’s Trail Burners in August. The exact tour was the Highlands Explorer tour (they also offer several other trips that include the Highlands and Isle of Skye, as well as customized and private tours) and you can read a complete review from Laurence of that trip (including info about the driver/guide, bus, lodging, itinerary attractions, fellow travelers, etc.). Our trip included the services of a driver/guide, a group of 15 people (the max group size), a new Mercedes-Benz small tour bus, and transport to all the attractions on our itinerary. Guests get to choose their level of accommodation (from hostel to 5-star hotel), whether they tour attractions or not, and most evenings are free so guests can explore on their own. Rather than rehashing all of what Laurence wrote about, I wanted to focus this post on the specific day-to-day itinerary for those wanting to visit the Scottish Highlands and the Isle of Skye, which are two of the most popular areas of Scotland for visitors. This suggested Scottish Highlands itinerary covers most of the major sites in both places and should help you choose the best bus tour for you or plan your own independent trip to the Scottish Highlands. We started our trip from Edinburgh, but one could also easily begin from Glasgow, Inverness, or another location and adjust this itinerary as suited. Laurence and I caught a bus from our home in Roslin (a village about 6 miles from Edinburgh) and checked in at the Rabbie’s Cafe which is centrally located in Edinburgh. It is nice that you can grab coffee and breakfast here before you leave. We then met our driver/guide Ross and learned that our tour was fully booked (meaning 15 guests total) and we loaded into the comfortable Mercedes-Benz bus to start our tour. Ross gave us an overview of the tour using a map and asked if anyone had any questions before we set out north. That day we had a long drive ahead of us, heading from Edinburgh to Ullapool (some Rabbie’s tours overnight in Inverness instead of Ullapool). Ross drove us by some of the main attractions of the city as we were driving out of Edinburgh. If you have not visited Edinburgh before, I would consider spending a few days in the city before or after your trip to the Highlands. It is a beautiful city full of history, culture, art, and good food and whiskey! For Edinburgh recommendations, you can check out our top 21 attractions in Edinburgh and for those who have been to Edinburgh before or have more time to explore check out these 25 lesser known Edinburgh attractions. The red Forth Bridge is a cantilever railway bridge that crosses over the Firth of Forth about 9 miles from Edinburgh. 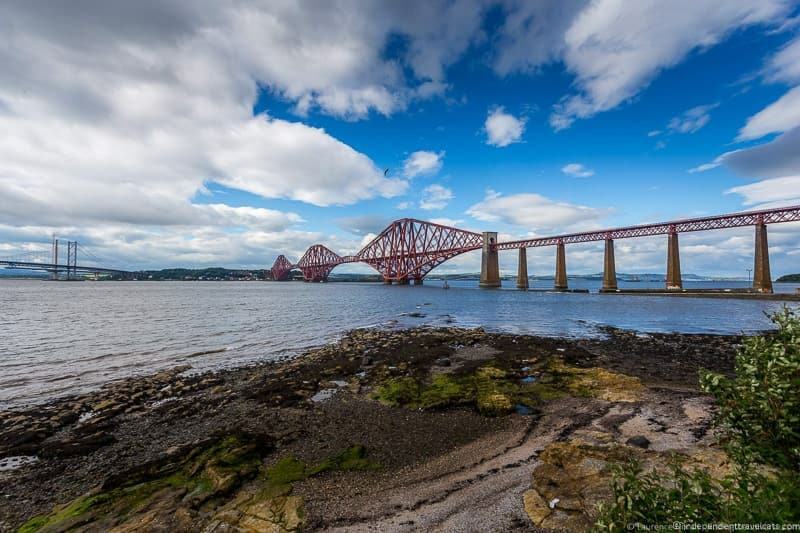 It is the most famous bridge in Scotland and is a UNESCO World Heritage Site. It was designed by the English engineers Sir John Fowler and Sir Benjamin Baker. You’ll also see here two other bridges: the Forth Road Bridge and the new Queensferry Crossing. We drove by the Forth Bridge on the first day of our tour but stopped for a photo stop on our last day before returning to Edinburgh. The town of Queensferry is also worth a quick exploration if you have time. Our first stop was the picturesque Perthshire town of Dunkeld that sits along the banks of the River Tay. 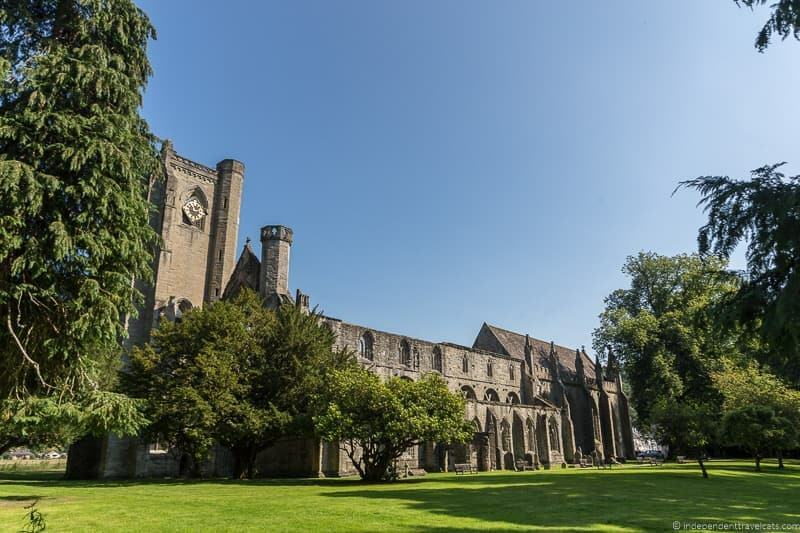 The Dunkeld Cathedral is the main attraction which is now a part ruined and part active parish church. It was built between the 13th to 16th centuries, thus encompassing a number of architectural styles and elements. Other things to do in Dunkeld include walking along the river to see the Thomas Telford Bridge, checking out the shops along Atholl Street (and the Atholl Memorial Fountain), checking out the colorful exteriors of the “Little Houses” of Dunkeld which include twenty 18th century private houses restored by the National Trust of Scotland, and stopping at the National Trust owned Ell Shop, which is a restored weaver’s shop. If you have more time, there are a number of lovely woodland walks around Dunkeld including taking a trail through the Hermitage. The House of Braur is actually a Scottish country clothing store that has morphed into a giant complex including multiple shop buildings, a food hall, cafeteria, and art gallery. This is a popular tourist stop for lunch and shopping. We had a quick lunch at the cafeteria and also bought a couple of gifts at the sales building which is located in the very back building (head here if you are shopping on a budget). However, for those not very interested in shopping, there is a wonderful hike you can take from the shopping complex to the Falls of Bruar. The hike to the waterfalls is along a well-marked path and is easy to moderate in difficulty. Find the trailhead by going to the House of Bruar car park and then walk around the building and follow the signs for Falls of Bruar. There is a choice of two marked paths. It is about a 30 minute walk to the lower falls and bridge another 30 minutes or so to reach the upper falls and upper bridge on the longer circular path. We just did the walk to the lower Falls of Bruar and the first stone bridge which we found very lovely and definitely worth the hike. Robert Burns loved the waterfalls but felt that there were not enough trees at the time. 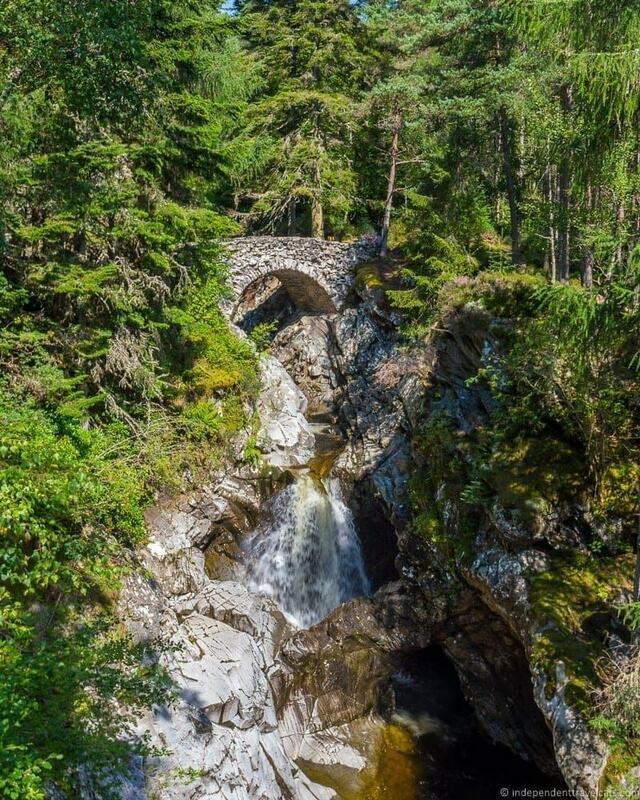 So he wrote the poem The Humble Petition of Bruar Water to the Noble Duke of Atholl, which asked owner John Murray, the 4th Duke of Atholl, to plant some trees and bushes around the waterfalls. Eventually Murray did just that and also laid out the paths that are still used today. 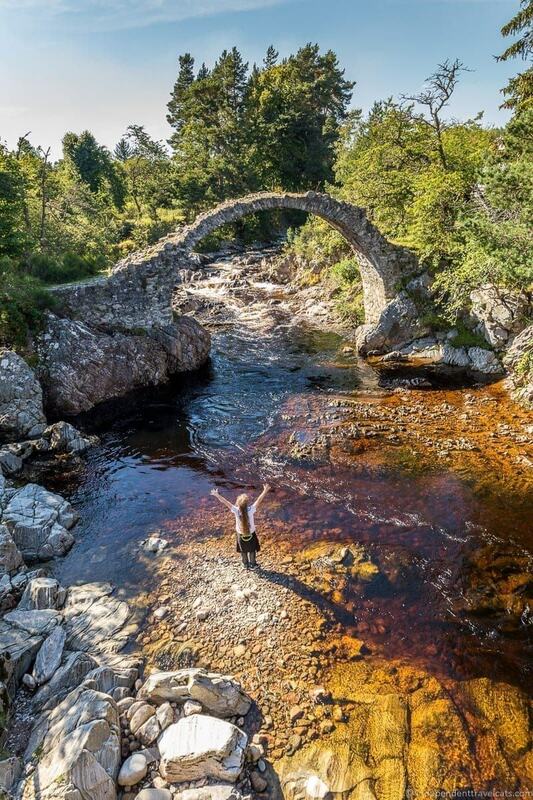 Carrbridge is a small town named after its most famous attraction, the Bridge of Carr. The Bridge of Carr was built in 1717 for estate purposes by Brigadier-General Sir Alexander Grant to provide passage for foot passengers, horses, stock, and for coffins being transported to Duthil Churchyard. It was also locally nicknamed the “coffin bridge”. Carrbridge also has several shops and cafes that you can visit and it is a short but pleasant stroll through the town. Cairngorms National Park is the largest national park in the United Kingdom, and it includes the largest area of native woodland in Britain and 4 of the 5 highest mountains in the UK. The park provides a refuge for some of Britain’s threatened and endangered animals including a number of raptors, the capercaillie, and the Scottish wildcat. Cairngorms National Park is a great place for outdoor pursuits and hiking, cycling, climbing, camping, and wildlife viewing opportunities are abundant year-round. In winter, there are snowsports and in summer watersports. Everything from golfing to castle tours are also possible within this vast area. This is a stop for most tourists heading north, not because of the loch itself but because of the legendary Loch Ness Monster that is believed to inhabit the lake. The Loch Ness Monster, affectionately called Nessie, is believed to have been first reported in 1933 although some say reports date back to the 6th century. There are people who still look for Nessie including resident Loch Ness monster hunter, Steve Feltham, who has been keeping a watchful eye on the loch since 1991. The loch itself is notable for being the second largest loch in Scotland based on surface area and the largest lake in the British Isles based on volume. It is a large lake and quite deep and murky in parts, which has kept the legend of the Loch Ness Monster alive. We had a brief stop here and walked along Dores Beach and said hello to Steve Feltham who has his home and shop set up here. Some visitors were swimming when we were here as the sun was shining although the water was still fairly cold. Other popular things to do on and near Loch Ness, include visiting the Loch Ness Centre and Exhibition, visiting Urquhart Castle, and taking a boat cruise on the loch. Inverness is often considered the unofficial capital of the Highlands, serving as the administrative center for the Highland council area and being the largest city in the Highlands with a population of about 50,000. Inverness has nice river views, a historical Old Town area, Inverness Castle, St. Andrew’s Cathedral, and several museums, including the Inverness Museum and Art Gallery. 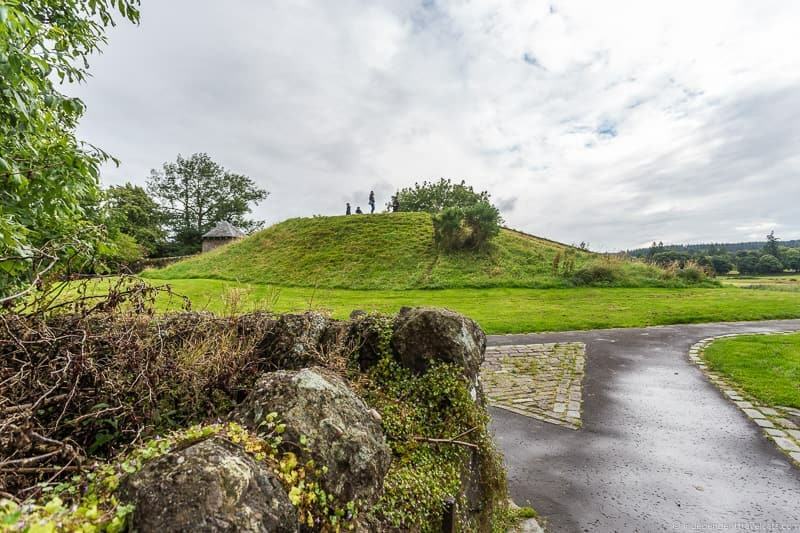 There are also a number of walking paths leading from Inverness and several attractions within a short drive that you can visit, such as Fort George and the Highlanders Museum and the Culloden Battlefield. If you are starting your trip from Inverness, Loch Ness is an easy day trip being only a 30 minute drive from Inverness. Inverness is also a great place to stock up on any supplies you need for your trip as most towns in the Highlands have only small grocery stores and shops and services are more limited. Inverness is also the starting point for the North Coast 500 route and you will see some of the North Coast 500 attractions along the drive or with your tour. If you have extra time and want to drive the full route you can detour here and head north. Here are some reasons to drive the NC500 to give you an idea of whether it is a good fit or not. We recommend at least 5 days to do the full route at a moderate pace. Our final stop of our first day exploring the Scottish Highlands was in Ullapool. Ullapool is a small fishing village located on the east shore of Loch Broom. Although a small town, it is a major tourist destination in the Scottish Highlands as it offers a number of lodging options, shops, and restaurants. It is a pretty town to walk around, particularly the harbor area which is home to a wide array of boats, from fishing boats to yachts. 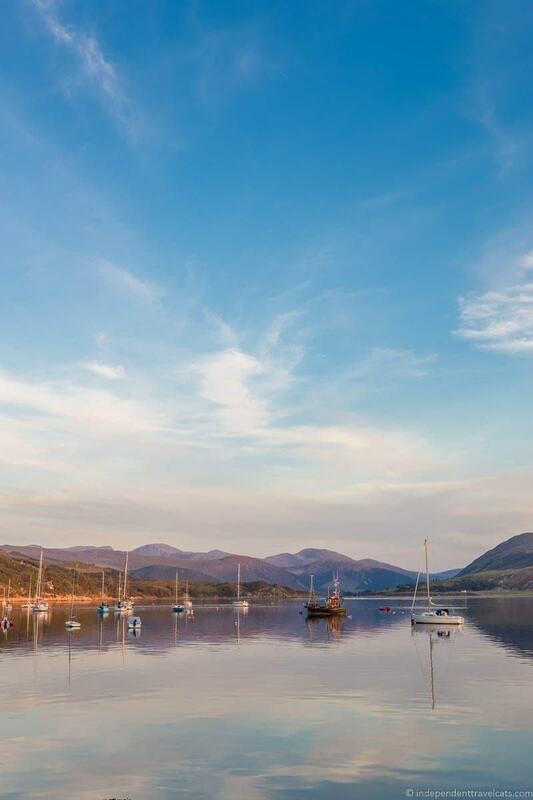 From Ullapool, you can also catch ferries to the Hebrides. We stayed in the Riverside B&B which serves a hearty Scottish breakfast each morning. While in Ullapool we had a nice dinner at The Celidah Place, a recommendation from our guide Ross, which is one of the nicer restaurants in town and our food was excellent! The next evening we grabbed dinner after sunset from The Seafood Shack, which is a new and popular food truck serving fresh local seafood for diners on the go. Tips: This first day of our trip was a long day of driving, although punctuated by some great stops. If you are doing your own tour and have more than 5 days, I would consider breaking this day into two (or three) separate days so you have more time to explore these places. After a hearty Scottish breakfast at our bed-and-breakfast, we headed out for the second day of exploring the Scottish Highlands. Compared to the first day, this day was light on driving and bus time with frequent stops and all the locations were relatively close to Ullapool. We did a circular loop from Ullapool and back, stopping at lochs, beaches, and historic ruins. The Sutherland area of the Scottish Highlands doesn’t get a huge number of visitors and is an easy place to find some peace and quiet amongst its wind-swept beaches and craggy lands. This was the day that we learned that Ross is an avid photographer, trying to add in extra photo stops when possible which made Laurence very happy! This is definitely one advantage of taking a tour as the drivers know the best places to stop for photos. We made several minor stops in the area (a few of which I am not exactly sure where! ), but here are the main places we visited on the second day to help you put together your own Scottish Highlands itinerary! A short drive from Ullapool, we had a 30 minute stop at Ardmair Beach, which lies on the shores of Loch Kanaird and has a long pebble beach. It is a tiny fishing village but today is mostly a holiday area. During the summer and holiday season, you can rent boats here and there are a number of self-catering chalets and homes, as well as a caravan and camping park. It is a great base for hiking or boating. Another one of our photo stops was at Stach Pollaidh, which is a craggy mountain known for its many sandstone pinnacles. It is a popular place for climbers of all sorts as the mountain can be climbed in less than 3 hours and offers nice views and some interesting rock formations. Next we headed to the village of Achiltibuie and made several stops in and around the village. The village is known for its seafood, particularly its lobster and crab so a good place to stop for a seafood lunch. The village was used as a filming location in the British/Roman historical drama The Eagle. There are a number of walking paths, easy-to-climb mountains, and beaches in the area around Achiltibuie. 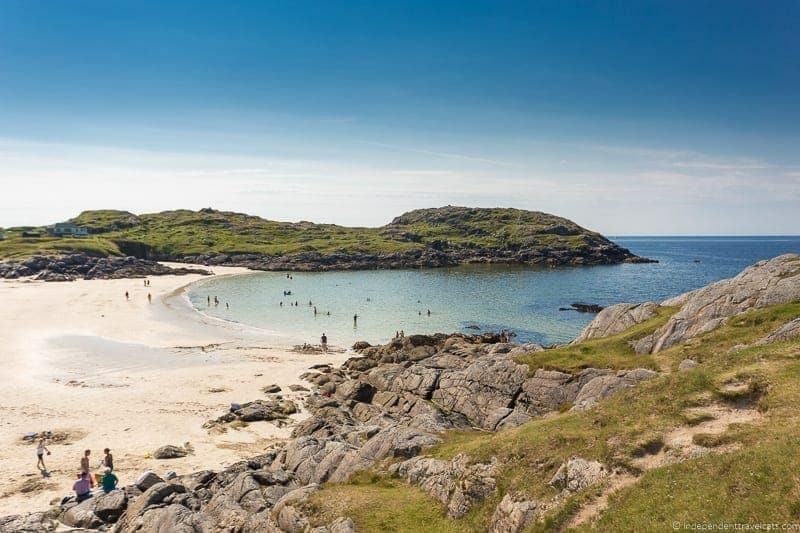 Achiltibuie is also a great gateway to the Summer Isles, a group of 20 small islands lying off the Coigach peninsula, and boat trips are possible to reach the islands where you can explore rock formations, caves, and beaches. In this area, as in many areas of the Highlands, you can still see remains of former tenant homes and local crofter’s stone houses. 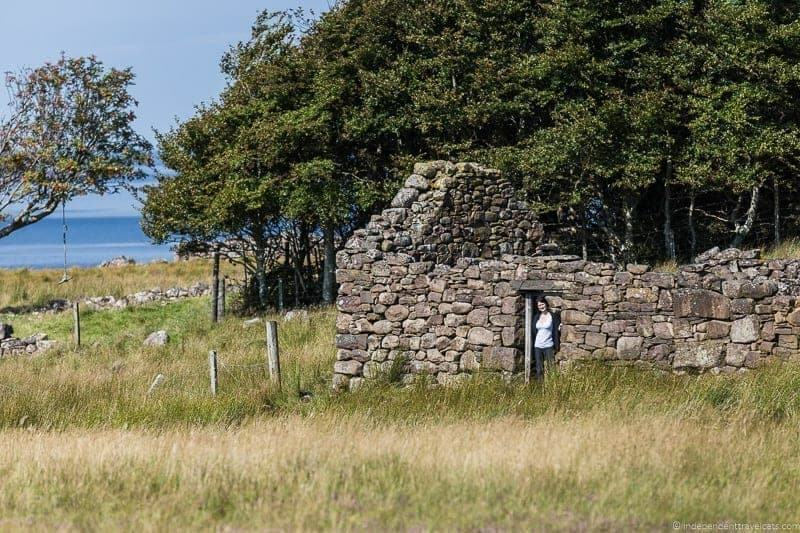 Many of these ruined homes belonged to the local people around the time of the Highland Clearances which was the large-scale forced displacement of Highlanders in the 18th and 19th centuries who had been living as tenant farmers. The Clearances led to a steep decline in the population of the Scottish Highlands as people were forced to leave and it sadly led to the destruction of much of the Gaelic culture in the region. Crofting laws were later established to help protect tenants who were previously at the mercy of landowners who could easily force eviction. A croft is a unit of agricultural land that is regulated by special crofting laws, often used by tenants although they can also be owned by the occupier as of 1976. Crofting is still practiced today in parts of the Highlands and on some of the islands of Scotland. Achmelvich is another small settlement along the northwest coast of Scotland in the Sutherland area. It has become a popular tourist stop because of its pretty bay and sandy beach, as well as caravan park and camping park. There is also a hostel and self-catering lodging available in the area. Note that pets are not allowed on most parts of the beach and caravan/camping parks. Achmelvich Beach is a beautiful beach on a sunny day and Laurence and I were very surprised at the size and look of the beach, as it looks very out of place in northern Scotland with its light sandy beaches and turquoise waters. People were out swimming and kayaking during our visit, although the waters were still very cold and many were wearing wetsuits to stay warm. We also had a great short hike along the coast and if you are spending some time in the area you might also consider some nearby climbs, such as the distinctive Suliven mountain. This area is a popular place for swimming, hiking, water skiing, boating, fishing (permit needed), and wildlife viewing (birds and sealife). You can also take a short walk to what is believed to be Europe’s smallest castle (term used somewhat loosely), known as the Hermit’s Castle built in the 1950’s. 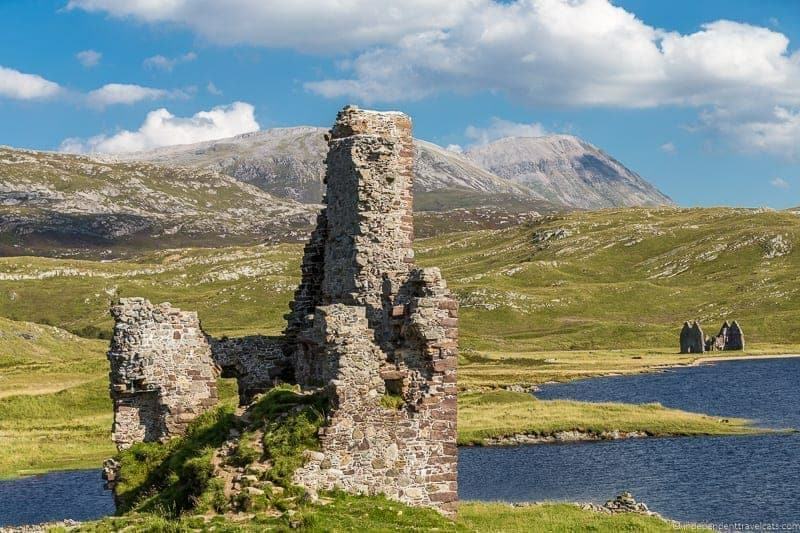 If you love historical sites, I would plan a stop to see the ruins of Ardvreck Castle and Calda House which have a picturesque setting next to Loch Assynt. Ardvreck Castle is believed to have been constructed by the Clan MacLeod in the late 15th century with additions of the tower and upper portion of the castle in the 16th century. The castle was later attacked and captured by the Clan MacKenzie in 1672. It was a wife of one of the MacKenzie men who persuaded her husband to build a more modern and comfortable home nearby called Calda House around 1726. Calda House was one of the first classical style homes in the Scottish Highlands and likely the grandest house at the time in the Highlands. Debts of the MacKenzies soon forced them to leave their house and put it up for sale. It was later burned in 1737 and never rebuilt. There are some great information panels here talking about the two buildings, the MacLeod and MacKenzie families, and some of the tales associated with the buildings. You can walk to and around both buildings, but be careful as neither are structurally sound. When the waters of the loch are high, it floods the peninsula causing the castle to be cut off from the mainland. To reach it at these times, you’d need to wade or swim across a small channel or water. After our visit to Ardvreck Castle, we headed back to Ullapool for a free evening on our own! After another filling Scottish breakfast at our B&B, we headed out to make our way to the Isle of Skye, where we were going to spend the night in the town of Portree. Today our goal was the Isle of Skye, but the day was filled with loads of sights and stops on the way, including several lochs, a spectacular mountain road, and the majestic Eilean Donan Castle. Today the tour was definitely about the journey, rather than the destination! A loch is simply a Scottish word for lake and we made photo stops at several lochs on our third day in the Scottish Highlands as we journeyed from Ullapool to the Isle of Skye. A few that we visited along our route were Loch Broom, Loch a’ Chroisg, and Loch Clair. The lochs vary greatly in size, character, and atmosphere throughout Scotland and the weather really makes a giant difference. Sometimes you have moody cloudy foreboding looking lochs and other times sunny lochs with glass-like surfaces offering beautiful reflections! Great places for a nice walk. We next stopped in the village of Torridon for a morning coffee break. It is a pretty area located along the shores of Loch Torridon and the hills of Torridon are some of the oldest in Europe. It is a popular place for hiking, kayaking, canoeing, cycling, and other outdoor activities. We specifically made a stop for coffee at The Torridon Inn, which is located next door to the popular and luxurious Torridon Hotel. A number of other accommodation options are also available in and around Torridon. It was also near Torridon that we ran into some Highland coos, or cattle, and some of them happened to be grazing and resting right next to the road. 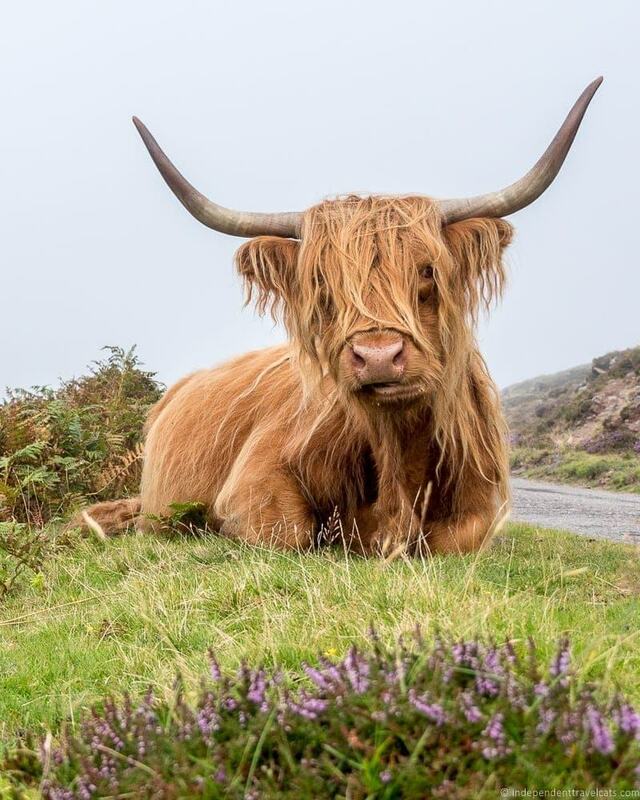 This Scottish breed of cattle is the oldest registered cattle in the world and a well-recognized icon of Scotland. After Torridon, we continued along the coast of the Applecross Peninsula which offered some nice views. We made our way to the little village on the Applecross Bay. 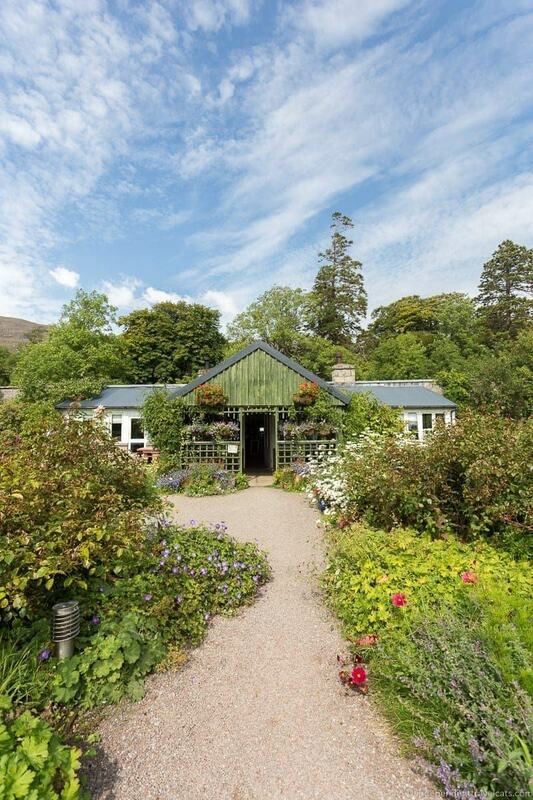 Here we had a nice lunch at Applecross Potting Shed Cafe & Restaurant. The food was good and the restaurant is worth a stop just to stretch out and view their pretty walled garden which was filled with all types of flowers when we visited. Nearby you can also see the exterior of the Applecross House and we saw several deer near the house. There are a number of walking options in the area as well that go around the bay or into the woodland area nearby. Applecross was one of the most isolated communities in Scotland and until the early 20th century was only reachable by boat. Then the Bealach na Bà mountain pass was constructed but it was quite a treacherous route and often inaccessible in winter. It was not until the late 20th century that the easier alternate low-level coastal route via Sheildaig – Kenmore – Applecross Road was built. We used this route to reach Applecross although we did take the Bealach na Bà on leaving Applecross. Next we drove the Bealach na Bà (“Pass of the Cattle”). The Bealach na Bà is a windy narrow mountain road that rises from sea level to an elevation of 2,053 ft. It is one of Britain’s highest roads and is famous for being twisty and having some tight hairpin bends and switchbacks. On a clear day, you can see some nice views of the Isle of Skye and other landmarks from the road. We were able to see some nice scenery along the way. It is about 11 miles in length and links Kishorn to Applecross. The road is not advised for large vehicles and caravans or to be driven in bad weather conditions. 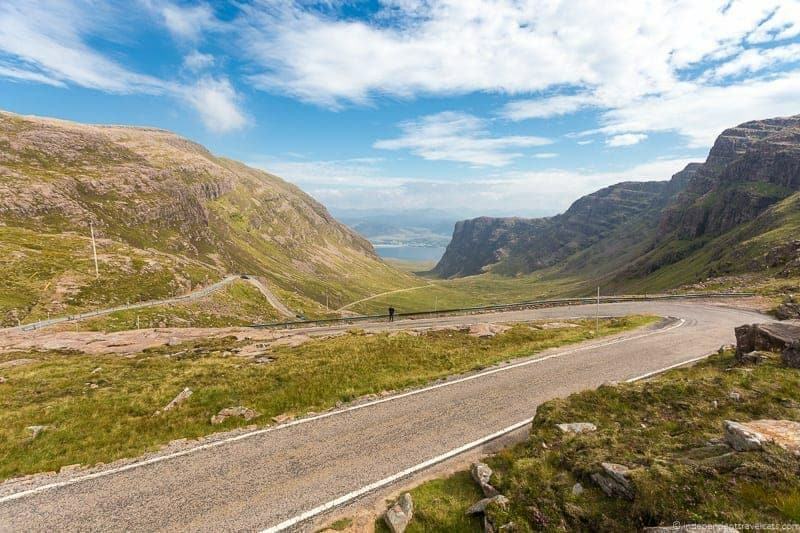 Today, as mentioned earlier, you can also take the easier alternate low-level coastal route via Sheildaig – Kenmore – Applecross Road to reach Applecross as we did when we arrived in Applecross. You’ll likely recognize the exterior of Eilean Donan Castle as it is one of the most photographed Scottish castles. It sits on a small tidal island at the intersection of three lochs and is located near the village of Dornie. The original castle was believed to have originated from simple fortifications built in the 13th century by the Clan Mackenzie and became the stronghold of the Mackenzies of Kintail. The castle was also used by their allies the Clan Macrae who were assigned as constables of the castle. The castle sprung up in stages over the centuries, but was falling into dereliction by the eighteenth century. 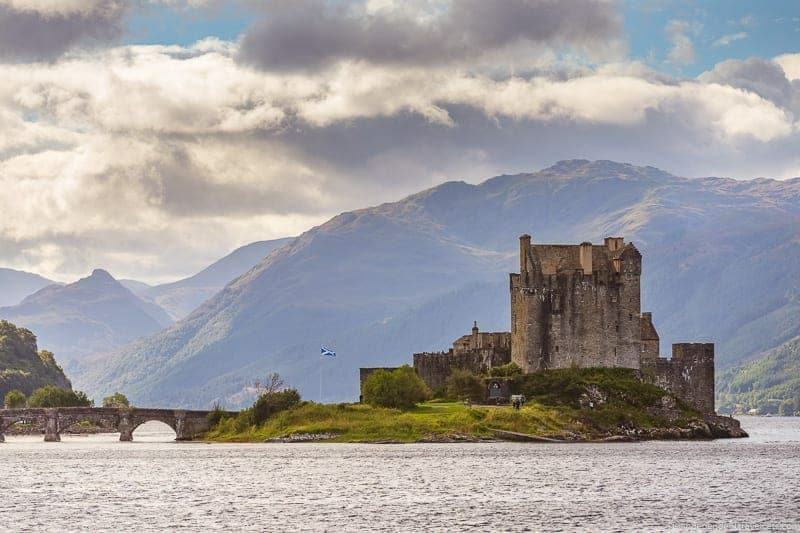 Eilean Donan Castle was largely destroyed in 1719 by the Royal Navy on an attack of Spanish soldiers occupying the castle who fought on behalf of the Jacobites supported by the Mackenzie and MacRae clans. The castle lay in ruins until 1919 when restoration was begun and the castle was rebuilt between 1919 and 1932 by John MacRae-Gilstrap. It was opened to the public in 1955 and can be reached by a footbridge that connects it to the mainland. So the castle of today is a rebuilt version of the original as very little of the original remains although there are some masonry fragments, a few artifacts, and the remains of a medieval tower that can still be seen on a visit today. It is often advertised as a 13th century castle but it dates only from the 20th century. Despite this, the castle is still an interesting place to explore with some lovely artifacts, a beautiful timbered Banqueting Hall, and lots of information on the MacRae family who still run the castle through a trust. However, the problem with the castle is that it is often very crowded with visitors and since many of the staircases and passages are quite narrow, it can be a bit claustrophobic inside the castle. We were able to enjoy our visit, but it would have been more pleasant if we had visited at a less crowded time. So if you can visit it first thing in the morning or during the off-season I would recommend doing so. We arrived on the Isle of Skye a little before sunset on the third day of our Scottish Highlands trip. The Isle of Skye is not technically part of the Scottish Highlands, although it is administered by the Highland council area. The Isle of Skye, sometimes nicknamed the Misty Isle, is the largest and most populated island of the Inner Hebrides islands. We arrived via road crossing the Carrich Viaduct which connects the mainland of Scotland to the island of Eilean Bàn and then across the Skye Bridge which connects Eilean Bàn to the Isle of Skye. Ferry crossings and public buses are also alternate ways to reach the Isle of Skye from the mainland. Ferries from Skye can also transport passengers to other islands. One of the first distinguishable geological features that we came across once on the Isle of Skye en route to Portree was the Cuillin. The Cuillin is a range of rocky mountains, that are often referred to as the Black Cuillin and sometimes also include the Red Cuillin. The Black Cuillin are true mountains, mainly compased of gabbro, and twelve of the peaks are listed as Munros (a Scottish mountain over 3,000 ft. in height named after Sir Huge Munro). Sgùrr Dearg has the only peak (topped by the Inaccessible Pinnacle) that requires true rock climbing in Scotland to reach, making it one of the most difficult Monros for those engaged in “Monro bagging” where hikers attempt to summit all of Scotland’s almost 300 Monros. 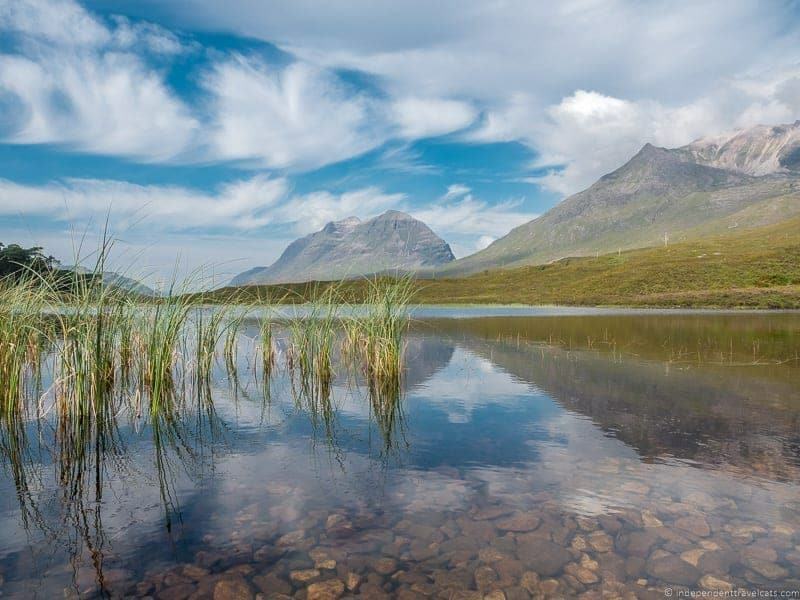 The Red Cuillin, also referred to as the Red Hills, are lower and more rounded than the Black Cuillin, mainly composed of granite. Portree was our destination for the evening, and our home for 2 nights. Portree is the largest town on the Isle of Skye and sits alongside a pretty harbor. It was originally mainly a fishing village but now caters mainly to tourism and serves as a hub for services to those living on the island (banks, grocery, churches, cinema, library, secondary school). 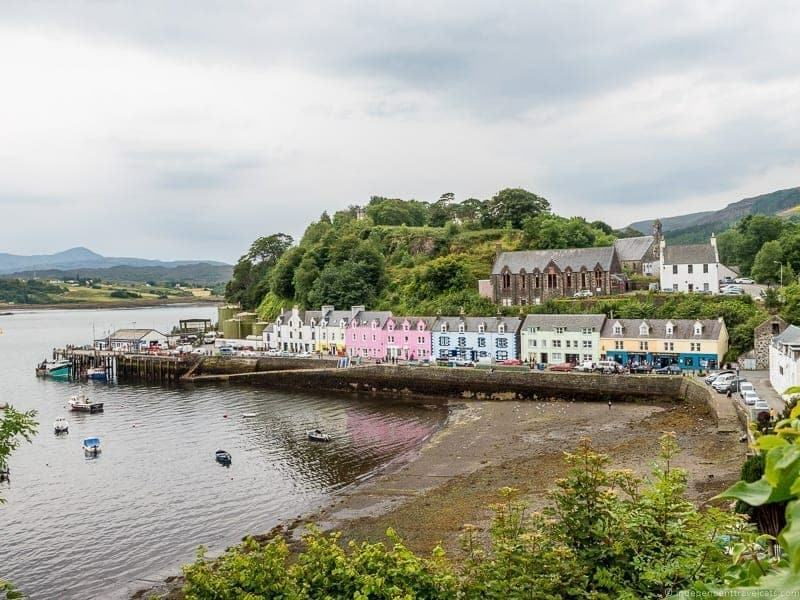 Portree has a lot of restaurants and shops for visitors and the harbor area is a great place to enjoy a walk or coffee. Many wildlife sightseeing boat trips also leave from Portree. We stayed in another bed-and-breakfast, this time the Feochan Guest House. We liked the guest house, tasty breakfast, and friendly hosts; however, I would only recommend this for those with a car or those who are OK with a walk into the city as it is about a 15 or 20 minute walk into the town center of Portree from here. After another hearty Scottish breakfast, we headed out to explore our new surroundings. The fourth day of our Scottish Highlands itinerary was filled with stops all over the Isle of Skye, taking in a number of the most scenic and historical sites on the island. Unfortunately our luck ran out on this day and in the afternoon the amazingly good weather stopped and we ended up with lots of clouds and rain. This limited us doing some of the intended hikes and dampened our enthusiasm for wandering around the lochs and beaches, but we still really enjoyed our time on the Isle of Skye and can’t wait to return. One of our first stops was to take a look at the Old Man of Storr, which is one of the most recognizable rock formations on the Isle of Skye. It is a finger of rock that juts out of the surrounding landscape. Ross told us the legend behind the name and you’ll find that many of the rock formations in Scotland have interesting legends behind them. The Old Man of Storr hike is one of the most popular and busiest walks on the island and it takes about 1.5 hours to hike up and down the trail from the carpark. We also stopped to see the beautiful Loch Fada nearby where you can see the Old Man of Storr in the distance. Mealt Falls are waterfalls fed from nearby Mealt Loch that plunge off the side of the sea cliff into the sea. With the backdrop of the Kilt Rock, the 90m cliffs shaped like a kilt, these are a stunning sight and we were lucky to have good weather to view it from the visitor overlook. We also read signs here that a very extensive collection of dinosaur remains have been found on the Jurassic rocks along this coast. We stopped in the village of Staffin for a coffee at the Columba 1400 Cafe, which has some nice views of the town. Columba 1400 is a social enterprise and charity with the jobs and funds supporting young people going through tough times. If you visit Staffin, keep an eye out for the unique dalmation houses, which are white houses painted with black spots. As mentioned earlier, a number of dinosaur remains have been found in certain areas of the Isle of Skye. 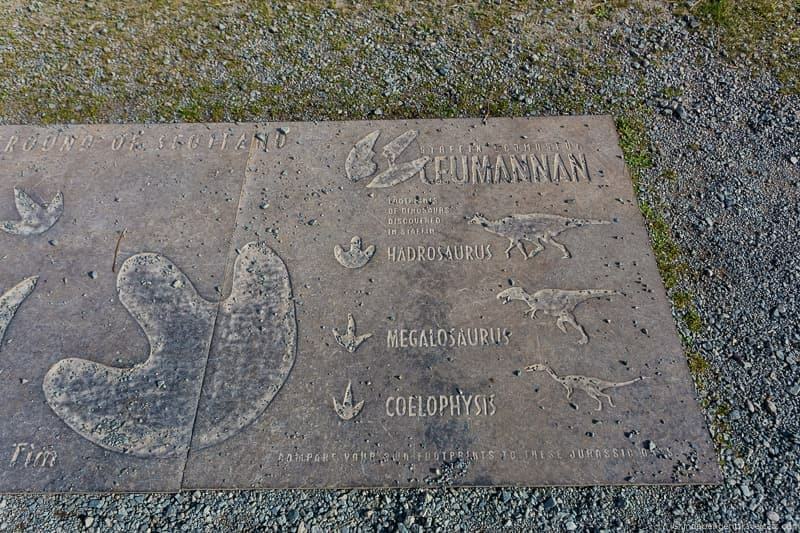 One such place is the dinosaur tracks found on the beach at An Corran in Staffin. A second track of dinosaur tracks have also been discovered along Score Bay near Duntulm Castle on the Isle of Skye. For those truly interested in the dinosaur fossils and tracks, I would make a visit to the Staffin Museum (best to call ahead as irregular hours and sometimes only open by appointment) which has a number of artifacts and the staff can also arrange lectures and guided walks for interested individuals. The next stop was a landslip called the Quiraing. A landslip may not sound very exciting but it is another distinctive area of scenery on the Isle of Skye and provides some nice views from the top. The landslip formed on the eastern face of the Meall na Suiramach, the northernmost summit of the Trotternish. 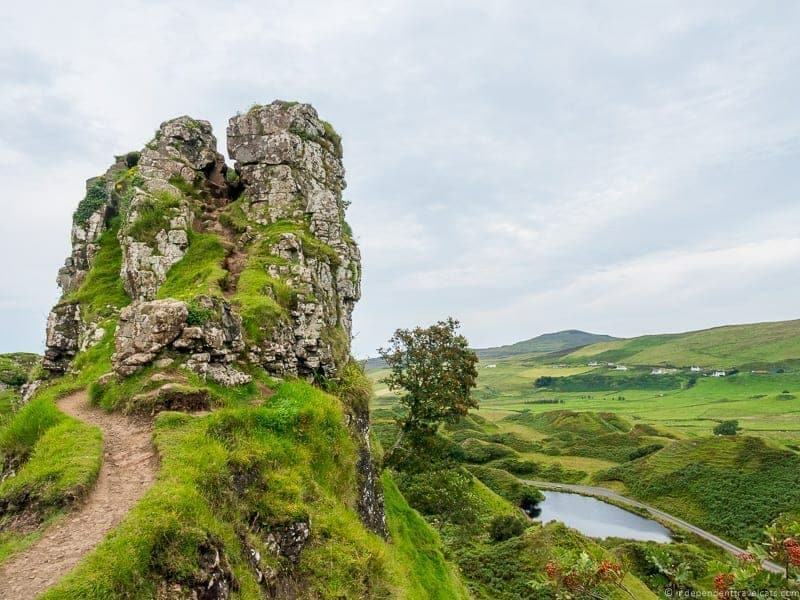 The Quiraing is home to a number of landmark rock formations, including The Needle, The Table, and the Prison and a popular place for hiking. 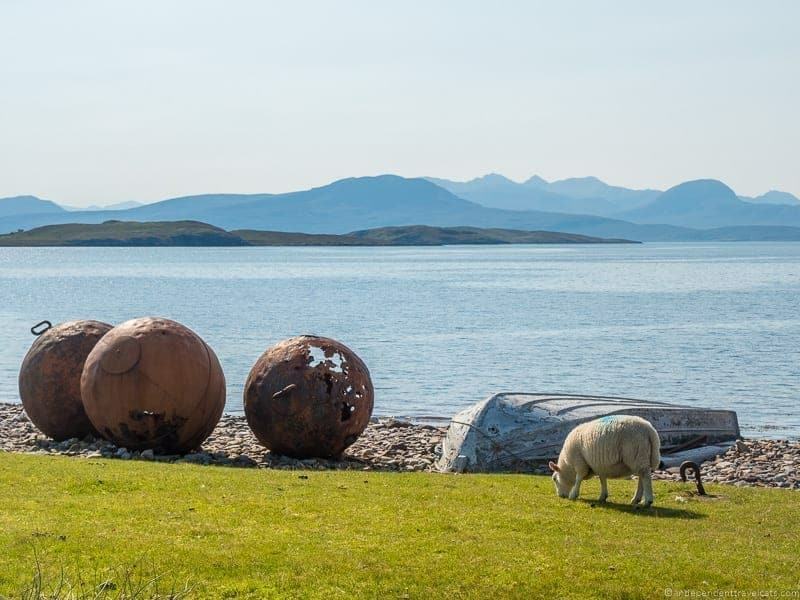 If you are interested in learning more of the history of the Isle of Skye and want to see what Highland life would have been like for past generations, check out the Skye Museum of Island Life near Kilmuir. Here you will find information and artifacts housed in a collection of thatched cottages. On the other side of the Trotternish Peninsula near Uig, we visited a curious geographic region known as the Faerie Glen. This is a grassy hilly area that looks a bit like a fairytale land that is the subject of folklore and legends, believed to be the home of the faeries. It is a great place to get out and wander and hike. A bit of a scramble allows you to reach the top of the large upthrusted rock formation known as Faerie Castle, also know as Castle Ewen. You’ll also likely find rock labyrinths near the castle. 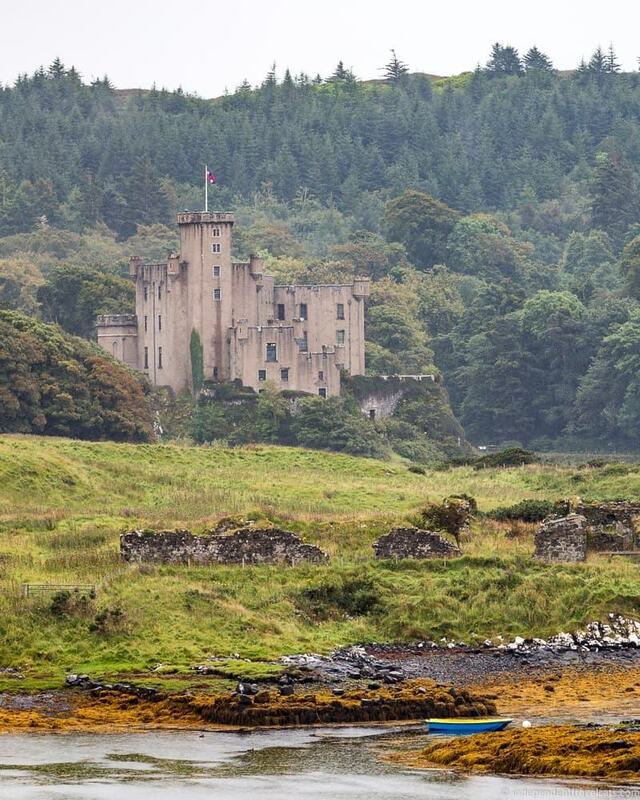 If you are looking for a castle to visit on the Isle of Skye, you may want to head to Dunvegan Castle. The first constructions of defense walls were initially built here in the 13th century and additions to the castle continued until the 19th century. Much of the exterior was heavily restored in the 19th century in a romanticized version of the original. The castle is unique in that it is said to be the longest continuously occupied castle in Scotland and has been the ancestral home of the Chiefs of MacLeod for 800 years. Inside you can see hundreds of years of artifacts, including the famous Fairy Flag that when unfurled in battle is believed to assure a victory for the MacLeods. Also of note here is the five acres of formal gardens that can be visited either in combination or separately from the castle. You can also book seal viewing trips, fishing trips, and boat cruises from Dunvegan Castle. About 20 minutes from the town of Dunvegan in Colbost is The Three Chimneys which is a popular and award-winning restaurant on the island. We haven’t eaten here yet but the reviews are wonderful and you can also stay overnight in the guesthouses. Neist Point is another of the Isle of Skye’s scenic points. Here on a clear day you will have excellent views over Moonen Bay. This spot is believed to be one of the best places for spotting sea birds, whales, dolphins, porpoises, and sharks on the island. It is also a popular area for fishermen. The Neist Point Lighthouse sits at the end of the causeway. Brochs are Pictish round towers built around 2,000 years ago, and there were many of them situated all over the Isle of Skye and northern Scotland. It is unclear what exactly they were used for, perhaps lookouts, defensive structures, or just homes. You can still see signs of them throughout the Isle of Skye, with one of the best preserved and most accessible being the Dun Beag near the village of Struan. There have been a number of coins discovered in and around this Iron Age structure suggesting it may have been occupied until the nineteenth or twentieth century. It is free to visit Dun Beag and there is a small carpark and information panel nearby. If you want to visit a distillery while on the Isle of Skye, then you’ll need to head to Talisker distillery in Carbost on the shore of Loch Harport. Talisker is the only whisky distillery on Skye. The original distillery was built in Carbost in 1830, but a stillhouse fire destroyed most of the distillery in 1960. The whisky set the nearby loch aflame! 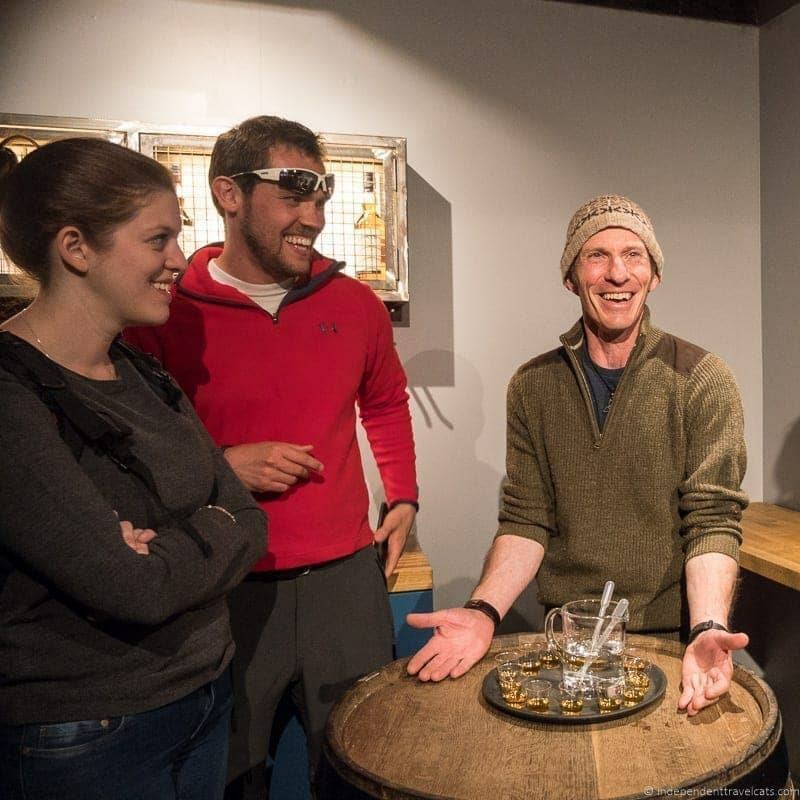 Visitors to Talisker can do a distillery tour, tasting, or just enjoy the visitor center and store. If you would like to do a tour, it is best to call in advance as in the busier months, there can be a bit of a wait. Another popular attraction on the Isle of Skye is the Faerie Pools near Glenbrittle. The Fairie pools are a series of scenic clear water pools on the River Brittle with small waterfalls. This is another popular place for a short hike, it is about a 45 minute roundtrip hike from the carpark to reach the main fairy pools. Sadly during our visit, it was raining and gray making the area very muddy and not a fun place to hike so we skipped the faerie pools and headed back to Portree for the evening. After arriving back in Portree, Laurence and I decided to have a dinner out on our own booking dinner reservations at The Granary. We had drinks and a nice dinner here and recommend it to anyone looking for a mid-range option for dinner in Portree focusing on local products. It was a great way to end our time on the Isle of Skye before walking back to our bed-and-breakfast. 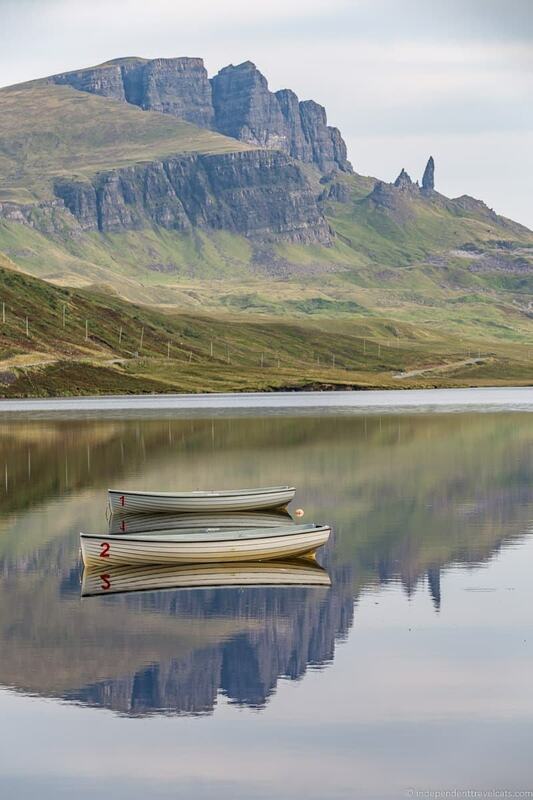 Tips: We would recommend spending more than 2 nights on the Isle of Skye if you have the time, especially if you are interested in doing boat tours, hiking, visiting museums, or want to just spend your time slowly discovering the treasures of this island. To see everything on the list above for more than a quick photo stop, you’ll definitely need more than one day. 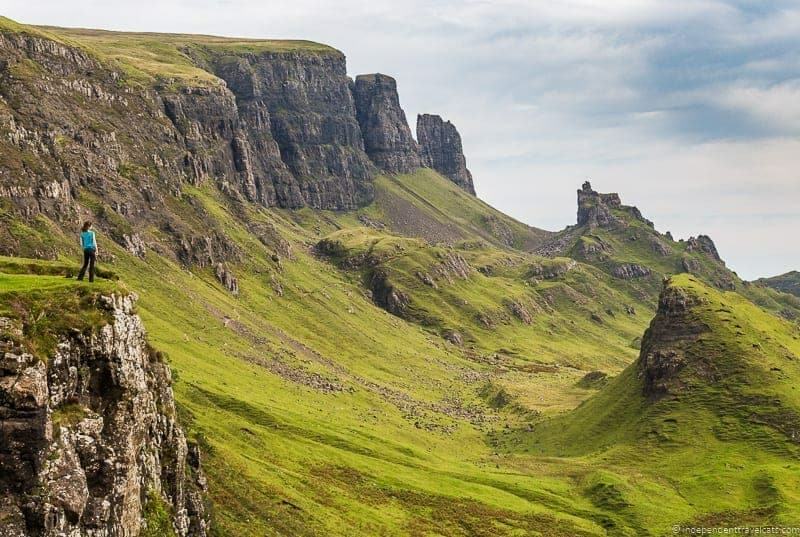 Our tour took in the major highlights of the Isle of Skye and a few other places that we recommend, but there is more to do on the Isle of Skye and if you have time, we’d recommend spending at least 3 days on the island if you can squeeze them into your Scottish Highlands itinerary. We’ve returned to Skye a number of times since this tour. If you have been to Skye before, have more than a day or two, or want to avoid crowds, you can read our tips for avoiding crowds on the Isle of Skye and finding lesser known attractions. However, if time is limited, you can still see a lot in 1 day and doing a tour like we did saves a lot of time as many of these locations can be tricky to find and parking can be an issue in the summer months. Having a driver made a big difference and saved us a lot of time. On the final day of our Scottish Highlands itinerary, we said goodbye to the Isle of Skye and headed back to Edinburgh. But along the way we saw an important war memorial, the tallest mountain in Scotland, famous scenery locations, and had a photo stop at a famous castle. One popular area of mountains for hillwalkers is Kintail which is mostly owned by the National Trust of Scotland. The Five Sisters of Kintail are a well-known set of high ridges with three of them being classified as Munros. Also in the area is the Falls of Glomach which is one of the highest waterfalls in Great Britain, but the falls requires a 8 km trek on foot to reach. We only drove by this area and heard the legend of the Five Sisters of Kintail from Ross (involving five disappointed sisters who were turned to stone) but would love to return to do some hiking here. Ben Nevis is the highest mountain in the British Isles at 4,411 ft above sea level, and is located near the city of Fort William. It is a popular mountain for Monro baggers and is one of the mountains included in the National Three Peaks Challenge in the UK. The mountain can be seen from a number of locations throughout the area and we stopped a couple of times to get photos. One good location is at the Commando Memorial. 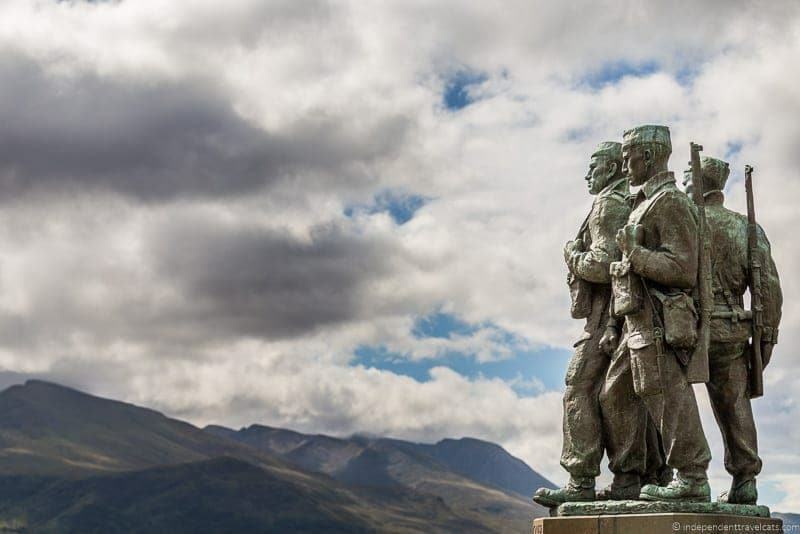 The Commando Memorial, located near the small village of Spean Bridge, is one of Scotland’s most famous war memorials, and is dedicated to the men of the original British Commando Forces during World War II. 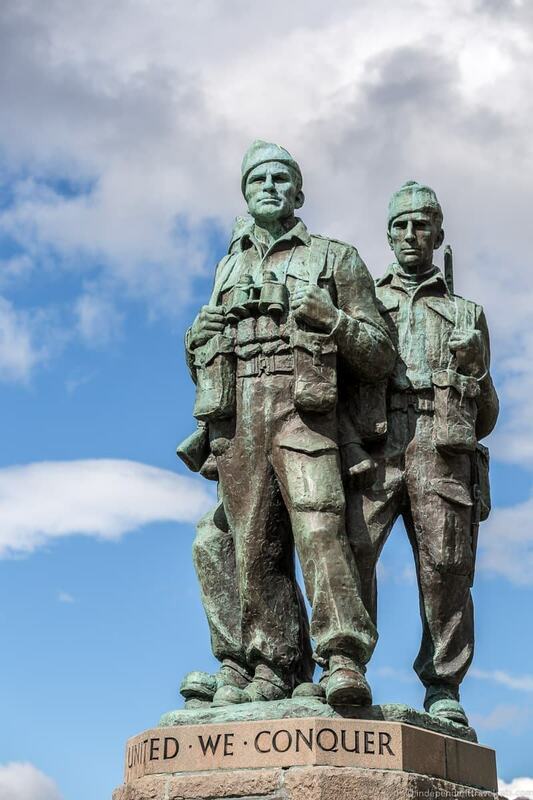 Officially unveiled by the Queen Mother in 1952, the memorial depicts three Commandos in full dress, cast in bronze, gazing south to Ben Nevis. The monument stands as a memorial to all the British Commandos who trained all over the Lochaber region. Today, the memorial is used for major memorial services, including the D-Day landings and Remembrance Day ceremonies. It is a popular tourist spot both as a stirring memorial and as a scenic overlook. Nearby in the small village of Spean Bridge we stopped for a break and some time for shopping at Spean Bridge Woolen Mill. We ended up picking up a couple of gifts, including some snazzy plaid winter hats! There was also a whisky shop with free whisky samples here. Fort William is a popular tourist center in the Scottish Highlands due to its proximity to a number of attractions and it is a central gathering point for hikers, climbers, and bikers. For instance, it is near Ben Nevis and serves as both the northern end of the West Highland Way and the southern end of the Great Glen Way. It is the second largest town in the Highlands with about 10,000 people so it is also a great place to pick up supplies and access services. There are a number of things to do in and around Fort William, but we had only 1.5 hours here so we decided to see the old fort ruins, explore the town center, and visit The West Highland Museum. To save time, Laurence and I decided to have a picnic lunch at the ruins of the fort which is a today a nice park and recreational area. There are a number of informational panels around the ruins that tell about its construction, use, and dismantlement. It was originally built by Oliver Cromwell’s forces in 1654 to pacify the local Clans and was later used as defense against Jacobite uprisings. After lunch, we walked into the town center and visited The West Highland Museum which we can highly recommend if you want to know some of the local history. The staff here were friendly and admission was free. As we were leaving Fort William we also got to see The Jacobite steam train take off which runs from Fort William to Mallaig. Glenfinnan, a nearby town, is a popular tourist stop for both its Glenfinnan Memorial (remembering those who died for the Jacobite cause) and the Glenfinnan Viaduct. The 21-arch viaduct is special on its own but has become a popular tourist attraction due to its use in the Harry Potter films. Glen Coe, also often written as Glencoe, is a beautiful glen of volcanic origins as well as the name of the nearby village. The River Coe runs through the glen, giving it its name. 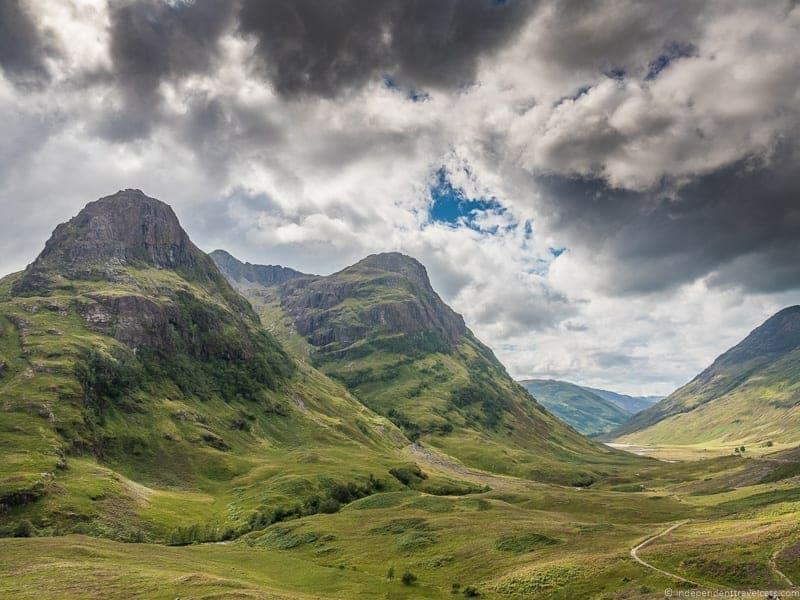 There are a number of interesting landscape and geological features here, perhaps the most well known being the mountain of Bidean nam Bian and its three steep ridges known as the Three Sisters of Glencoe. 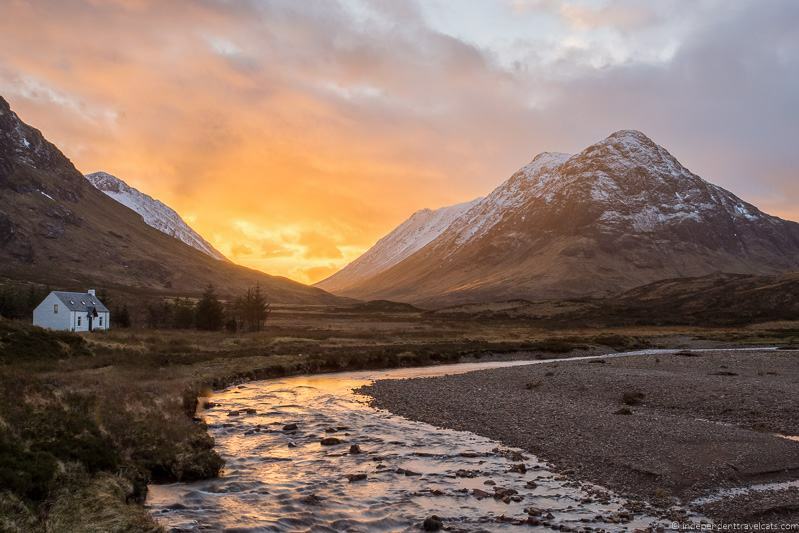 The glen is known for its photogenic beauty (see this stunning series of photos of Glencoe Laurence has taken), as the birthplace of the legendary Ossian (the cave of Ossian), and for the brutal 1689 Massacre of Glencoe. Glen Coe is also a popular movie filming location and the home of the fictional Andrew Bond, father of Ian Fleming’s James Bond. 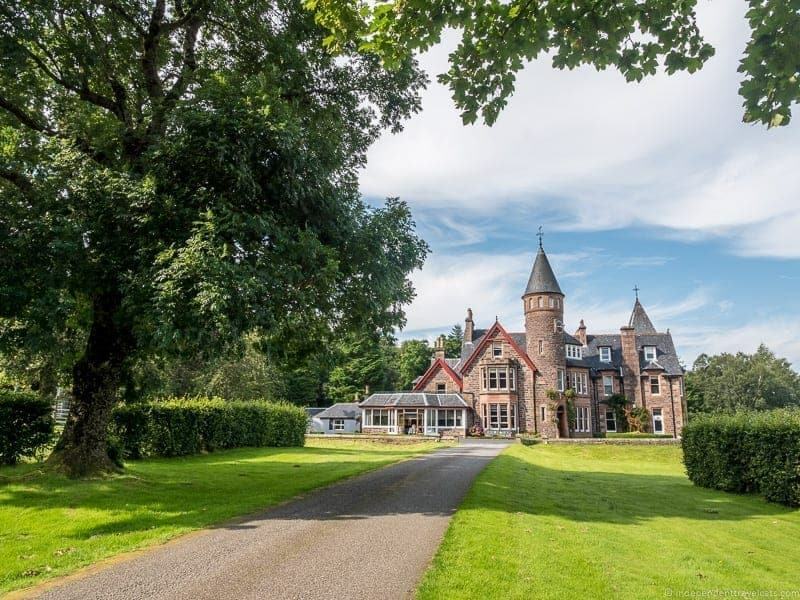 Once owned by the Clan Donald (a.k.a. MacDonald), the land is now owned and protected by the National Trust for Scotland. A stop at the Trust’s Glencoe & Daleness Visitor Center is a good place to learn about the history of the area and get information on popular walks and hikes in the area. If you are visiting in the summer, expect the carparks in the area to be busy. Callander is a small town often referred to as the gateway to the Highlands because of its location, and a popular stop for those going to or returning from the Highlands. We stopped here for a coffee break (at Apple Jacks), walked along the River Teith, and saw the small “Hill of Kessog” mound which is named after Saint Kessog who preached in the area in the 6th century. A popular walk from town is to the Bracklinn Falls. We learned here from Ross that the idiom “armed to the teeth” is said (at least by some) to have originated in medieval Scotland when Highlanders were asked to surrender their weapons before crossing the River Teith in order to sell and trade peacefully with the Lowlanders. If you have more time to venture beyond the Highlands, there are many great attractions between Callander and Edinburgh. A few recommendations (although there are many more), are Stirling, Doune Castle, and the Kelpies. The city of Stirling and nearby has a lot of great attractions, including Stirling Castle and the National Wallace Monument. 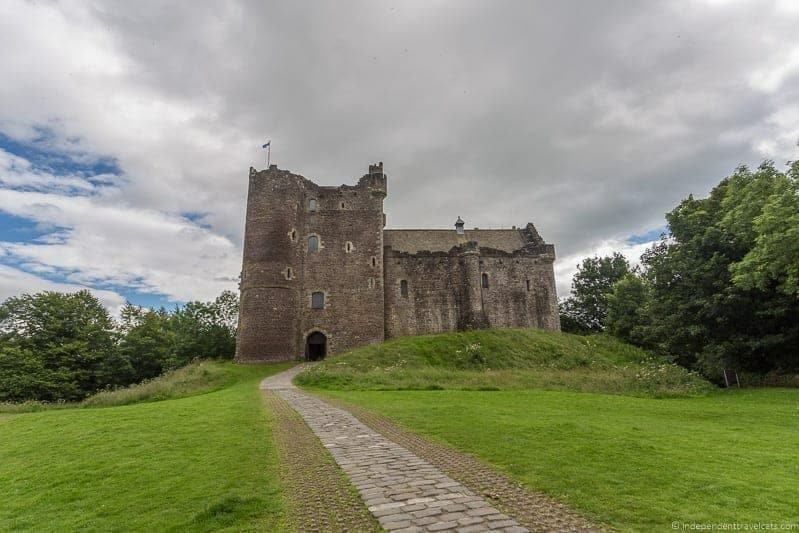 Doune Castle is a medieval castle made famous as the primary filming location for the cult film Monty Python and the Holy Grail and most recently used in Season 1 of the TV series Outlander. The Doune Castle audioguide is very good for doing a self tour of the castle. Also nearby are whisky distilleries that can be toured. The Kelpies are giant horse-head sculptures located near Falkirk in The Helix park. Built in 2013 as the largest equine statues in the world, these are fast becoming one of Scotland’s most popular tourist attractions. Also nearby is the unique and interesting Falkirk Wheel. After five full days of sightseeing, we returned back to Edinburgh around 7pm that evening, said goodbye to our fellow travelers, and then caught a local bus back home! This was my first time to the Scottish Highlands and both of our first times visiting the Isle of Skye and we loved it! Like most of Scotland, the Highlands are a beautiful area with loads of history and culture. 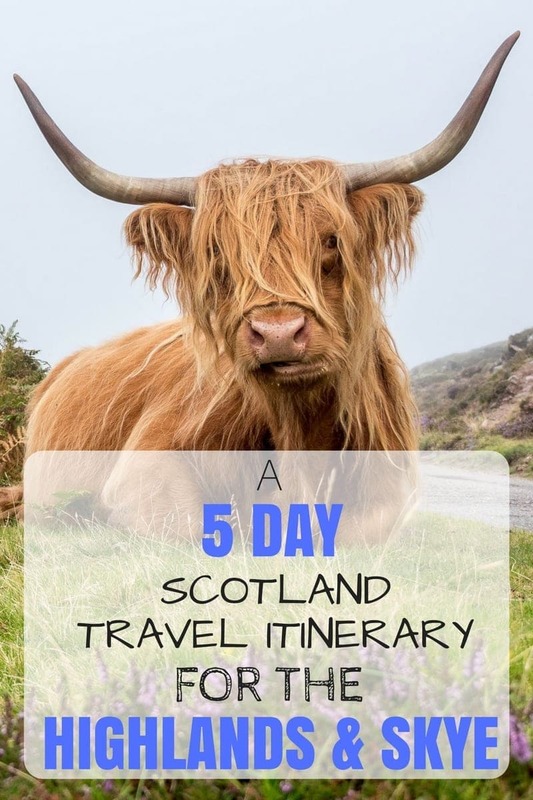 We saw so much in 5 days, and you can easily see a number of the highlights of the Scottish Highlands and Isle of Skye on a 5-day trip from Edinburgh (or elsewhere in Scotland). We can’t wait to return and are actually planning to spend a week on the Isle of Skye over Christmas with family. If you have more time, I’d recommend a week or so to travel more slowly and have more time to really explore these places, whether this is on your own or traveling with a tour. We had a great time with Rabbie’s and have done several tours with them and can highly recommend them in terms of price, driver/guides, booking policies (if you book a tour, the tour goes even if you are the only one booked! ), and itineraries. If you are considering a tour, I’d highly recommend reading over Laurence’s detailed review of our Scottish Highlands tour and my prior post on our tours to the Scottish Borders. 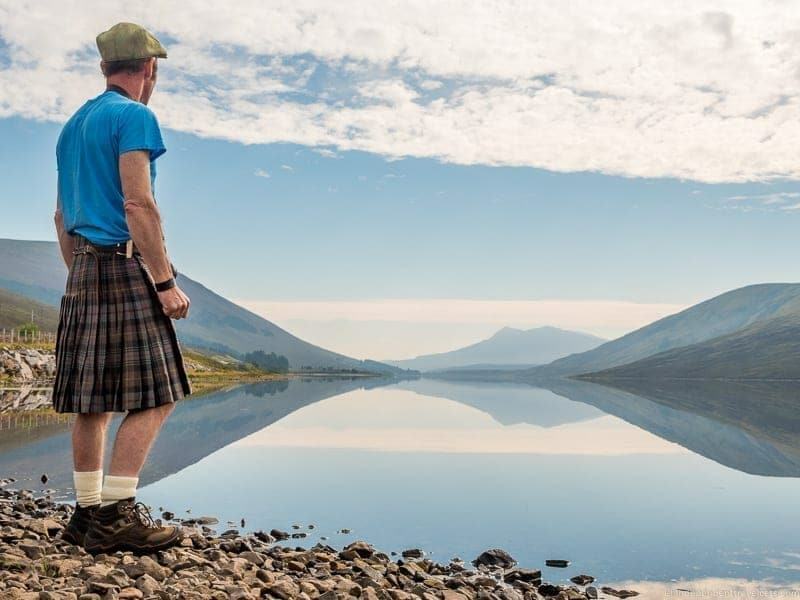 But whether you choose to book a tour or plan your own independent trip, we hope that this post is helpful in putting together your own Scottish Highlands itinerary! Have you been to the Scottish Highlands or the Isle of Skye? If so, let us know your favorite spots. If not, which of the above places would be at the top of your Scottish Highlands itinerary? 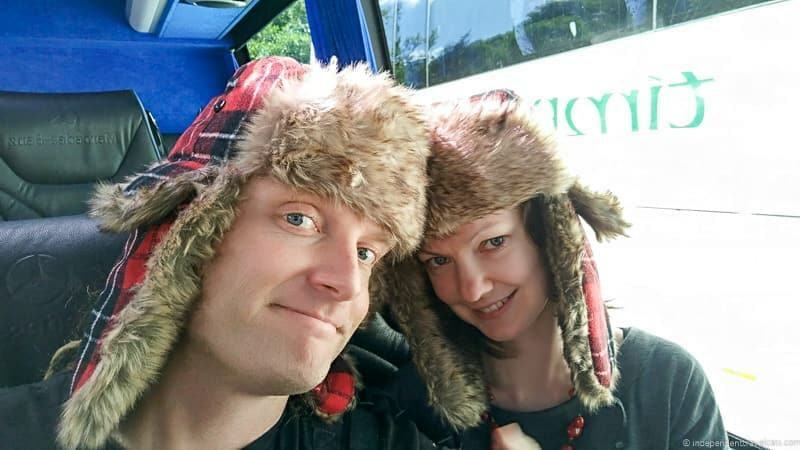 As always, we love to hear your comments and we’re happy to answer any questions about our Scottish Highland trip with Rabbie’s or any other questions you may have about travel to Scotland! Planning my Fourth trip to Scotland but first trip to Skye, so wanting to spend a minimum of 3 to 4 nights on the Isle. My question is what town would be the best home base? Would love to not have to change rooms each night. We are thinking of a September trip to capture more daylight hours and possibly avoid a lot of busy travelers. I would base where you stay on two factors: 1) where do you plan to visit and 2) how do you plan to get around (car, public bus). For instance if you plan to mostly visit spots around the northern and middle parts of the island, I’d stay in one of those two areas. But if you plan to drive all over the island, then I’d stay in the central area of the island. Access to most towns and attractions is quicker if you stay along the main road as well. So in that case you might look between Portree and Sligachan, or around that general area, especially since this is your first visit. I will assume you are driving, but if you are taking the bus, you’ll want to base near a bus stop (e.g., Portree, Armadale). Stagecoach is the bus service that currently operates on the island. I would book your accommodation in advance, as well as any tours or activities. But for your daily visits, I would keep those flexible if you can so you can work around weather in case you have some bad weather days on your visit. Check out our article on how to avoid the crowds on the Isle of Skye for specific accommodation recs as well as loads of tips avoiding crowded areas. Hope that helps, and if you have further questions as you plan your trip, just let us know. We’ve been to Skye in every season now and pop over there about once a year. Hi! Found this post and it is such a gem! Very useful information. This May, we’re headed to Scotland for 6 nights. We plan to do 3 in Edinburgh on the front end, and then 3 nights in or near Skye. We’re traveling with a young toddler (still napping), and so have to limit our transitions between inns. We’re doing Airbnb in Edinburgh. Do you have a recommendation for a town to stay in near or on Skye for three nights that would provide a lovely town to explore, and an ideal jumping off point for Highlands exploration (for jaunts no more than 1 hr drive away at a time)? Thanks in advance! Glad you are finding our website helpful in planning your first trip to Scotland! We have loads of content on Edinburgh articles here and on our other blog here. So that might be helpful in planning your 3 days in Edinburgh. We live just south of the city so feel free to shout out if you have any questions or need recommendations. Hmmm, on the Isle of Skye, the biggest city is Portree which has the most services (shops, hotels, restaurants), has a lovely boat harbor, and is walkable if you stay near the center. 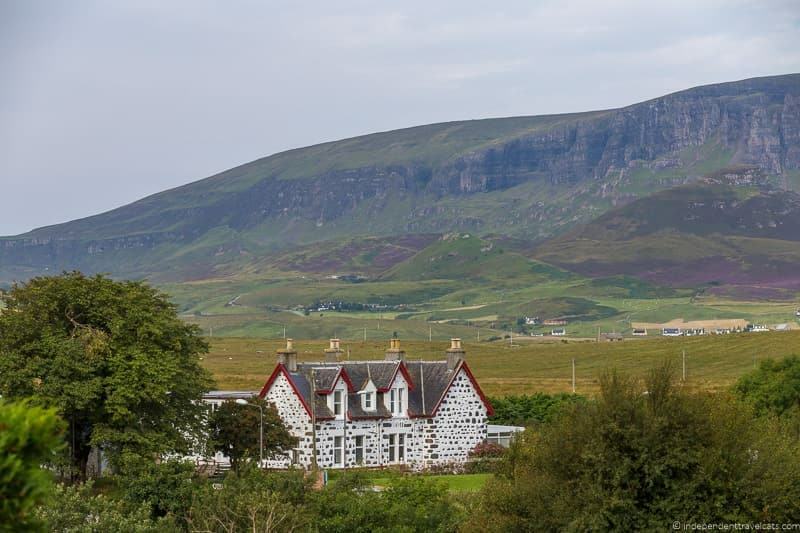 There are a lot of places to stay in Portree. However, it is a 50 minute drive from Portree to just get off Skye so it would not really allow you a chance to explore any other parts of the Highlands outside of Skye within a 1 hour drive. But I’d recommend Portree if you want to spend most of the time on the island and looking for a walkable place with stuff to do. You could easily spend all three days exploring different areas of the Isle of Skye as it is much bigger than most people imagine and travel times are slow because of the roads (many are single-track roads). Off the island, you could try Kyle of Lochalsh which is the town just before you cross the bridge to go onto Skye. It is handy in terms of location and has some walkable parts and a few shops and restaurants, but it doesn’t really have much in terms of actual attractions and not sure I’d describe it as “lovely”. It is about a 50 minute drive from Portree on Skye and is within about an hour of other places in the Highlands (e.g. Eilean Donan Castle, drive to Applecross, Lochcarron). For more loveliness, I’d recommend Plockton which is just a bit further away and is a small but pretty little town. It has several hotels & shops, and is walkable (stay near the center). It is about 1 hour drive from Portree on Skye and you can make many scenic drives within an hour to some other spots in the Highlands (e.g. Eilean Donan Castle, Applecross, Lochcarron). For lodging in Plockton, we can specifically recommend Plockton Inn or Plockton Hotel in terms of places to stay in the center. The town has palm trees (very unusual in Scotland! ), a little harbor and beach area, and there is a well-rated seal boat trip you can take from there with Calum’s Seal Tours that is family-friendly. Hope the above helps give you some good options! Just let us know if you have further questions as you plan your trip. Thank you very much! This is wonderful. We hadn’t stumbled on Plockton, and now I think that’s where we’ll stay for the three nights. Makes the drive to and from Edinburgh more manageable but still close enough to explore Skye. We’ll also check out your other recommendations, including for Edinburgh. Thanks again! 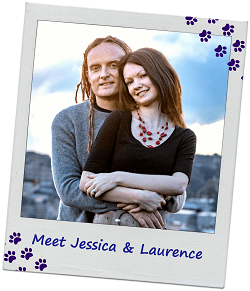 Many thanks Mr. Laurence and Mrs. Jessica for their excellent information. I do have a dream to travel to Scotland, especially on the Isle of Skype at the end of 2018. Hopefully I do not experience any obstacles to take care of tourist visa at the British Embassy in Jakarta. This was a such a great post. 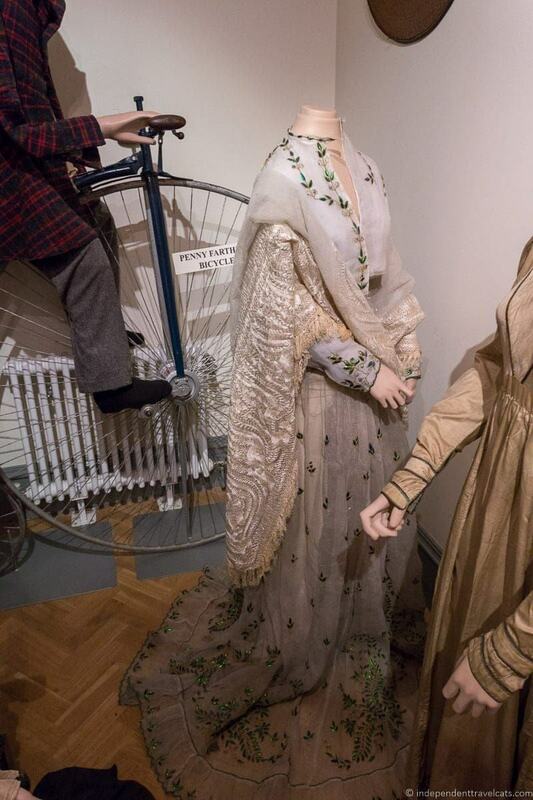 It was so detailed and gave a great idea of the whole journey. I felt as if I took the journey through the Highlands with you. i’m currently illustrating a map of Scotland Highlands and this post helped me a lot. Thank you! Just planning our days in the Highlands. You’ve made our planning so much easier. Thanks! You should also check St. Andrews, I took a trip there with a bunch of students and had a great time. Its basically a college town, really old, near the North Sea Coastline. Have you been to Stirling? It’s the town with the Wallace Monument and Stirling Castle. Charming place…. Great 5 day itinerary, I would certainly suggest staying for longer though. Next time you are passing through Contin on the way to Skye feel free to drop in to the Coul House for refreshments or why not stay the night and hike to Rogie Falls or Knockfarrel in the morning prior to breakfast. 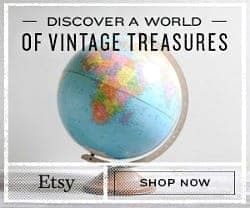 Great guide! I would definitely love to visit the Forth Bridge and take some pictures of the landscape from there. I’ve been only to Wales and few cities in the UK so Scotland is still undiscovered for me. Another great, detailed itinerary! We were in Edinburgh this fall and I very much want to see the rest of Scotland. There is all the gorgeous scenery. 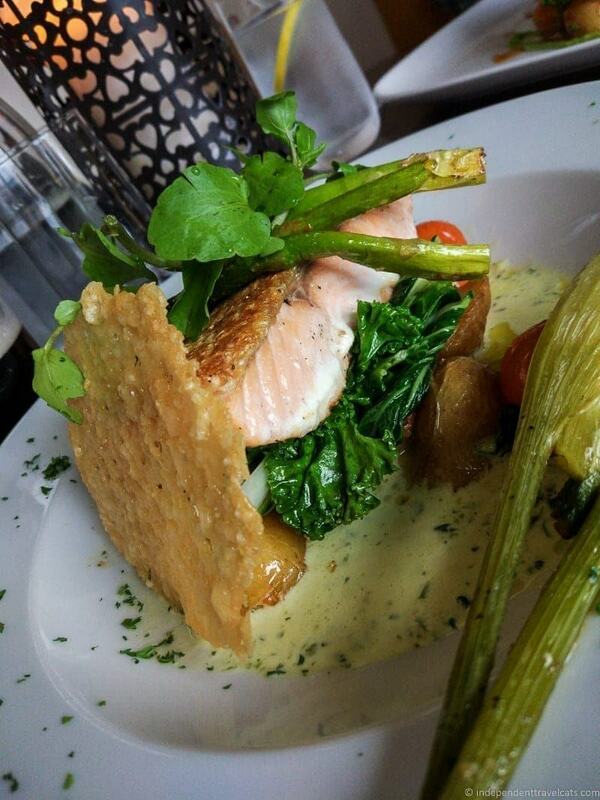 We were very impressed by Scottish food in Edinburgh and want to sample more. I’m a fan of Celtic mythology and the Gunn clan is somewhere up north. so lots of good reasons to get there! Jess, We loved our highlands road trip a couple of summers ago. We went to many of the places you mention in your itinerary. I was super surprised at how good the food was! I wonder if it’s possible to see these part of Scotland on your own. I like more flexibility in my schedule, although I agree that it’s more economic to book a tour. I didn’t expect to see so much sunshine in this area. 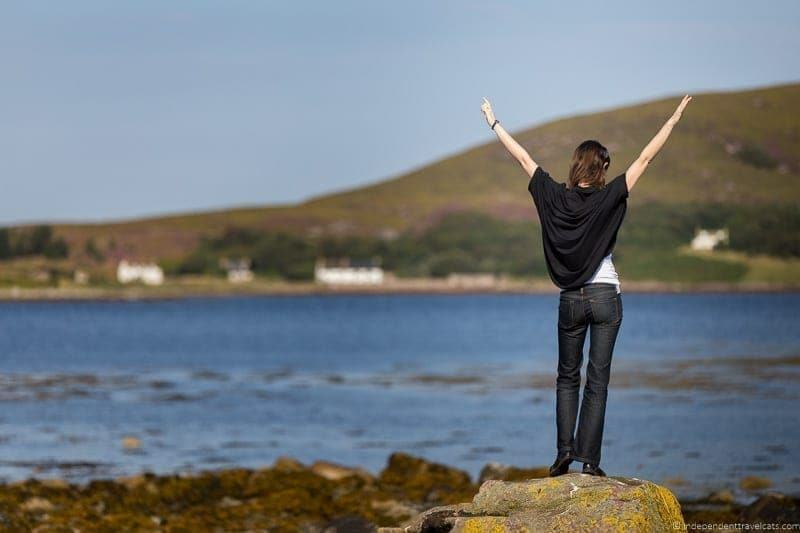 Were you just lucky, or sunny days are not so rare in Scotland? I think of that region as perpeptually cloudy. Truly gorgeous and looks like a perfect road trip. Got me thinking! Wow wow wow, your pictures are absolutely amazing. I went to Isle of Skye in September and loved it to. I still need to explore the Highlands more though. so this post is really helpful. I especially love all the castles. Thanks so much for sharing on #TheWeeklyPostcard! 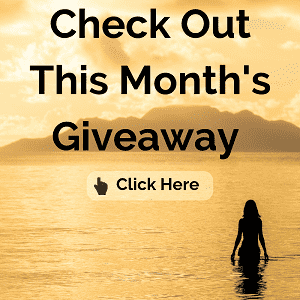 Great post….But I don’t think 5 days are enough to enjoy this amazing place. The Scottish Highlands is a most beautiful place and I think I will need lots of days to enjoy it! Its really a very informative post for the people who wish to travel Scotland. Thanks for the information!